It’s national Bacon connoisseur week, alas almost the end of the event, I only found out about it yesterday! Bacon is a funny thing, vegetarians often say it’s the meat they miss the most. One of the most evocative smells is that of bacon cooking, instantly making one feel hungry! I don’t eat very much meat so this is a very different post for me to be doing. However I do like bacon, very well cooked crispy bacon. I heard about bacon jam a while ago and was intrigued and if I’m honest initially kind of grossed out too. Then I kept on hearing about bacon jam and I warmed to the idea and started craving this strange jam. When I heard yesterday that it was bacon week I knew instantly that I had the perfect excuse to make bacon jam! I searched for recipes and came across this one from Martha Stewart. I recently bought a slow cooker for the first time and am still trying to think of ways to use it. As this recipe is made in a slow cooker I thought it a serendipitous find. I halved the recipe as I thought I may have a hard time convincing my husband to try the bacon jam! The recipe I used is this one from Martha Stewart. Apart from only making half of the recipe I didn’t make any changes. I did not have much bacon fat to cook the onions in so if making this in the UK, I think as it’s an American recipe, they probably meant streaky bacon, I used unsmoked back bacon. The only thing I did differently was to add the garlic once the onions were soft, I don’t understand adding onion and garlic to the pan at the same time as the garlic start to burn before the onions cook. I found the jam to be ready after 2 and a half hours. I can not believe I waited so long to try this! I also can not believe I made only half the recipe! This is so good, sweet and savory. It looks like a cross between Christmas mincemeat and chutney. I used it as chutney, well a lot of it I have eaten just by the spoonful, it’s that good! My husband will be having this along with the cheese I made in sandwiches next week. Yes he tried it and also loved it! This entry was posted on March 24, 2012, 18:28 and is filed under Jams and Chutneys. You can follow any responses to this entry through RSS 2.0. You can leave a response, or trackback from your own site. I am quite intrigued by Bacon Jam, ever since I discovered in the wonderful Spar in Walthamstow (I think they were the first with it in the UK?). Love the idea of a slow cooker version. Having read the recipe, I think jam is a misnomer, chutney would be better maybe? Great to see your new site up – well done on making the leap to self hosted! Thanks Helen! Blog is still not quite right but getting there, not self hosting yet just bought the domain, gosh I will need help to self host got into such a pickle just doing that! Yes it is more of a chutney than jam! I am now also intrigued by this and must say it looks pretty good in your photo. Think I may have to give this a try out of real curiosity, thanks! Thanks, I hope you like it if you do try it! He he, lovely to see a reference to the wonderful Spar in Walthamstow! They got their own label bacon jam on the telly with a jar of it held up by Jonathan Ross no less. I can trot round the corner and buy it whenever I like so never managed to make the effort to do my own. Your version in the slow cooker may just sway me! http://www.notquitenigella.com/2009/10/08/bacon-jam-your-wildest-dreams-come-true/ – it would appear to originate from the states where you can buy a manufactured version. Welcome to bacon! 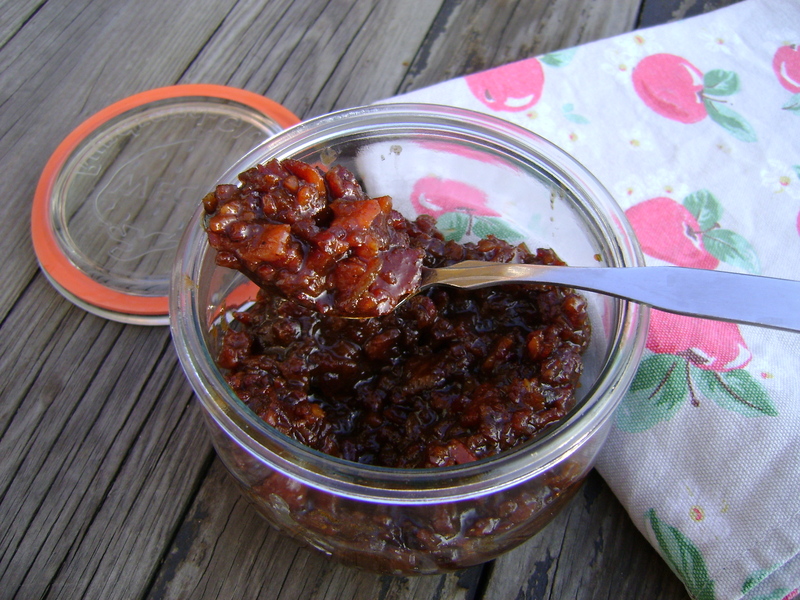 I made up a recipe for bacon jam using the guidelines of those who have gone before. I added rum and it turned out so good that I had to give it away before I ate it all! Yes, probably just as well I only made half the recipe, its a dangerous thing to have around! I made bacon jam from my own cured maple bourbon bacon Jayne and in the ingredients used to actually make it I added some espresso too. I just love it on freshly made biscuits; you know one of those morning when you eat 4 biscuits and half a jar of jam and can’t believe you did it? I will not allow myself to make biscuits, thanks for the tip, lol! Home curing your own bacon is most impressive! Ditto, great to see your blog up and running Jayne! I am very keen to try this soon! Thanks! Let me know if you do try! Brilliant to use the slow cooker for this Jayne! This is so popular here in the US, there is a company out in California that has made their fortune on it 🙂 Thanks for posting!